Contraptor, metalworker, global activist, steampunk... specializing in pedal-power. 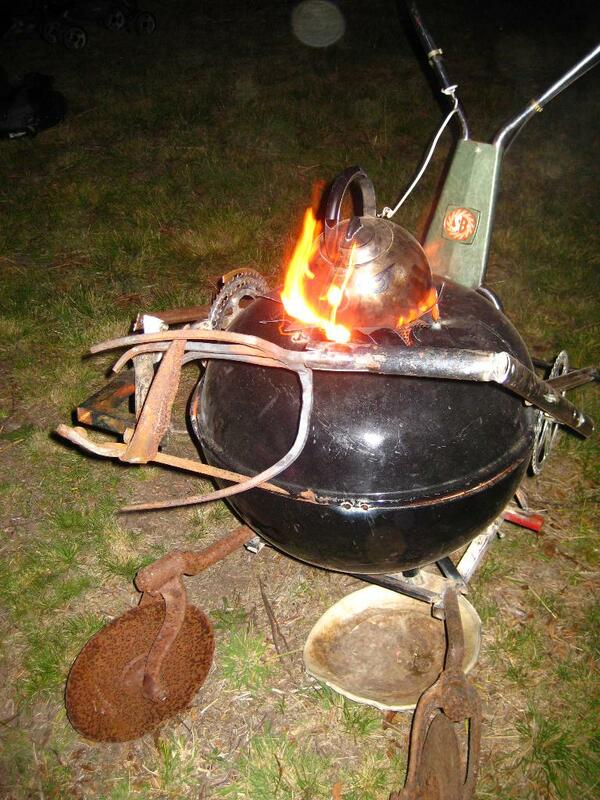 Using steel, wheels, and sewing, I rend Victorian æsthetics into a Mad-Max setting with a rigorous use of found and recycled materials. Prior to the start of the event, this was the first year where the bike crew had distributed all leftover Burning Man bikes to charity: To the Reno Kiwanis, to the Reno Bike Project, and others. Burning Man likes the idea of shipping some to my African bike project but I would need to raise the funding for the shipping. A shipping container of only costs $4-6,000 to ship to Ghana, but transporting the bikes out of the desert will be expensive as well. With the Pedal-powered Bumper Cars up and running from last year, I was free to express myself more creatively at this year's Corinbank festival. 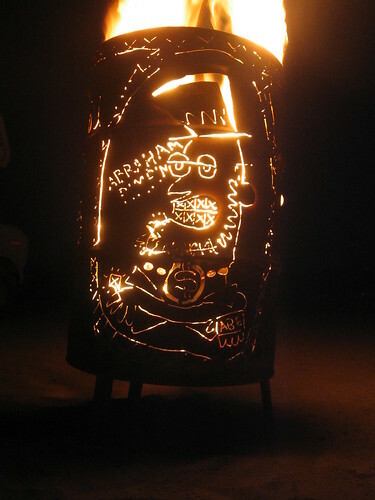 The festival had acquired a burn permit and weather conditions looked like they would allow for some fire art. His head is surrounded by a barbed-wire crown of thorns. 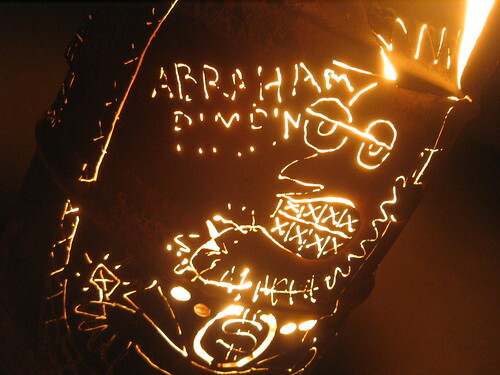 His hand was beaten on the forge out of an old pitchfork. When you place a log in his hand and pull down on the lawnmower handle, his mouth opens and he dumps the log into his flaming, greedy jaw. 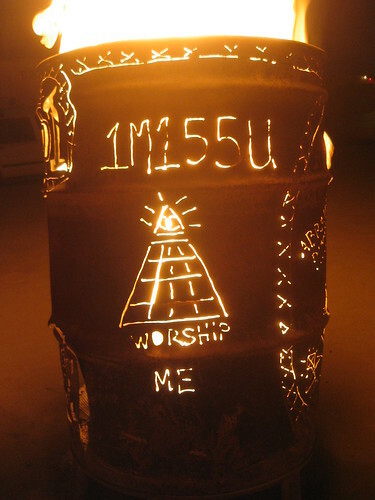 Before the Burning Man 2008 bicycle project began, I worked in the metal shop. 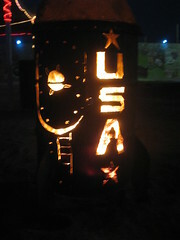 These are some of the burn barrels I produced to go with the event's "American Dream" theme. Something has gone horribly awry during this launch. Flames are spewing from the cockpit and the hatch. 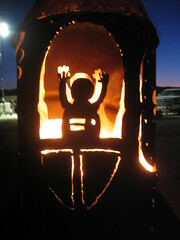 Behind the astronaut is a scoop that surrounds him in flame. 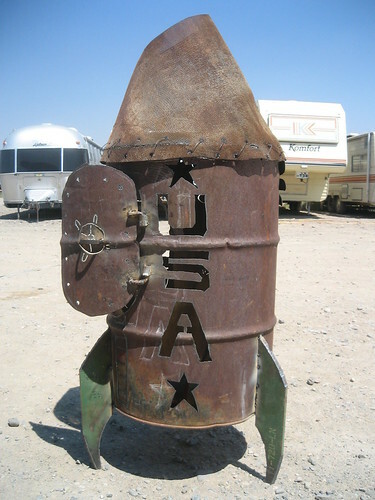 The belly of the rocket (shown above) features a tribute to one of america's fallen heroes. This barrel depicts a $1 bill with Abraham lincoln as a pimp. The seals on the bill say "worship me" and "R.I.P. 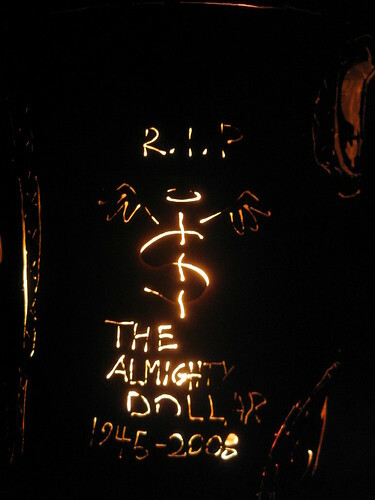 The American Dollar 1945-2008". You can see others, including 'Dale Woulda stopped 9-11' and 'Pizza, Tacos, and Chinese: Now That's American Food!' at my my Flickr photostream. This year the bike crew at Burning Man faced a new challenge: Assemble and paint 400 bikes, repair the existing fleet of 600, and distribute them all in addition to dealing with the abandonment of another 1100 bicycles in the Black Rock Desert. I worked in the metal shop before the event and managed the fleet repair and cleanup crews. We think the continued presence of community bikes accounts for the 400-bike drop in abandonments this year. Approximately a container's worth of bikes were dontated to the Reno Kiwanis Club, with another container set aside for my Ghana project. Fundraising continues for that shipment- we've got what we need to drop a container but not the shipping fee. The organizers of The Corinbank Festival wanted their first festival to impact the participants with its level of participatory, surreal, and unique attractions. They hired a circus school, marching band teachers, and the bizarre (but genius) clowns Wacko and Blotto to create an atmosphere where attendees were also welcomed to bring and set up "Creative Campsites" of their own. 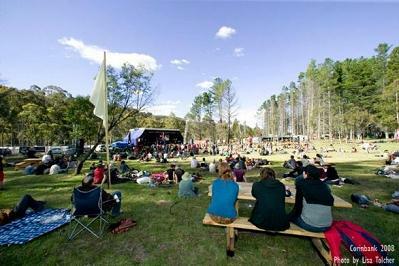 The festival was located in a beautiful valley in the Brindabellas, swimming with cockatoos and kangaroos. I was billed in the promotional material as an "Artist In Residence". 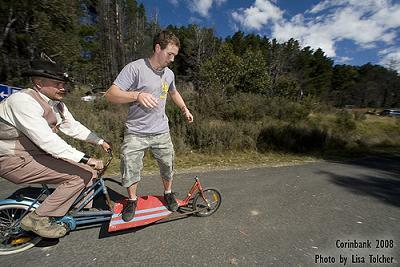 For the two months prior to the event I designed and built a pedal-powered attraction. Called the "Death Derby Arena", it was an area where people could try out a variety of wacky bikes I'd built, along with a pedal-powered bumper car rink. The bikes only appeared dangerous; in fact, there were no injuries all weekend. This bike had a surfboard on the front, so one person could pedal and the other could surf on land! 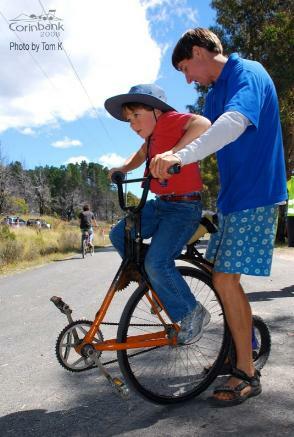 I made sure to provide bikes- such as this pixie bike with bull bars- for the smaller children, although it didn't stop the grownups from giving them a try. This smaller, safer version of my pennyfakething let the less-daring give it a try. 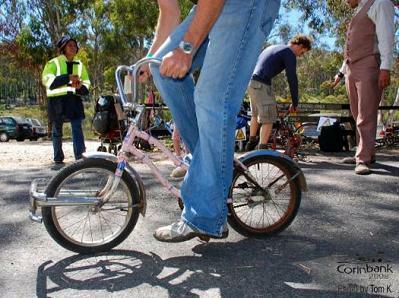 This chopper with a spring in the middle was not as hard to ride as it looks! 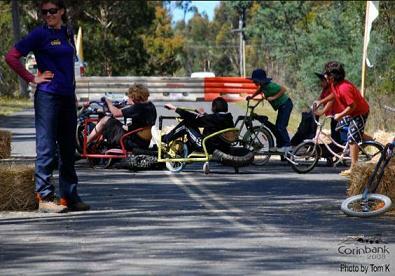 The pedal-powered bumper cars were a huge hit. You can see more about them here. 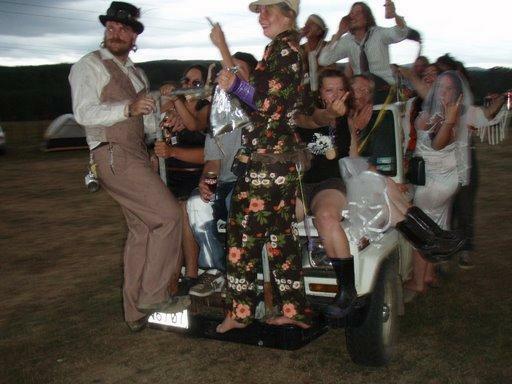 My original plan for the Corinbank festival's pedal-powered entertainment was to whip up as many wacky bikes as I could and we'd have a sort of rodeo. However, once two of these bumper bikes were completed, they were just too much fun. It was clear I needed to drop my plans and create a pedal-powered bumper car arena. The casters in the back cause the bike to spin out when it's hit. The arena size can be adjusted to prevent the sort of speeds that cause injury. 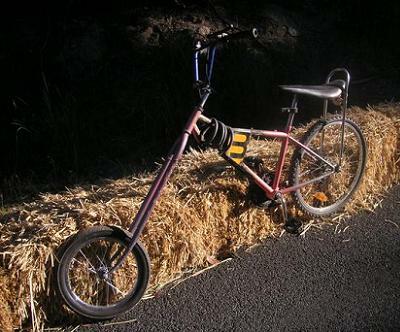 These bikes use 100% recycled material, and don't need the electric floor like the carnival version! 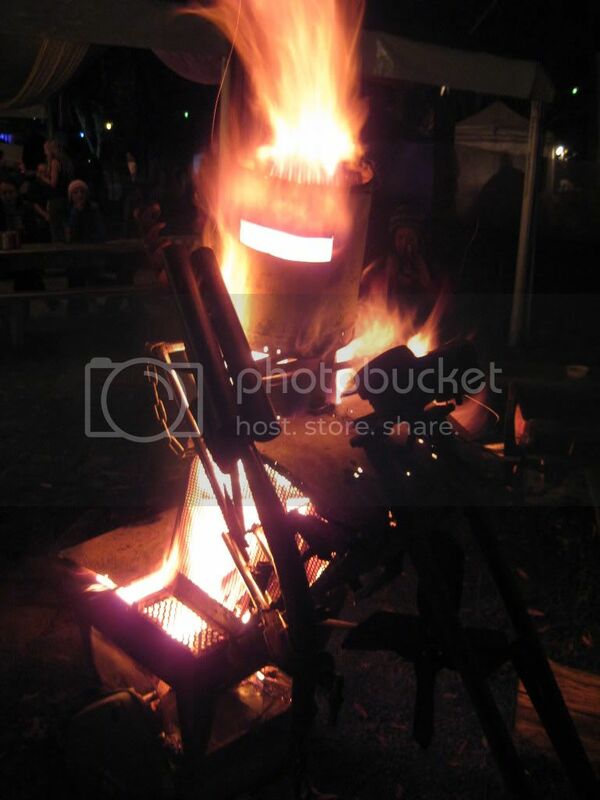 Kiwi Burn is the New Zealand regional of Burning Man. 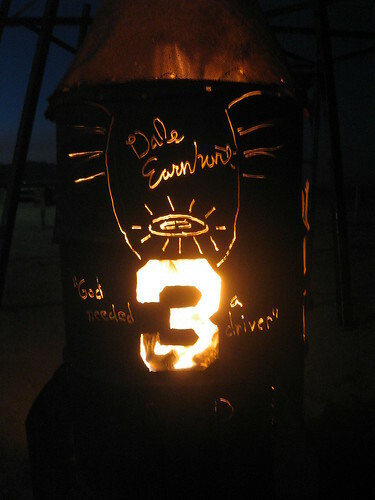 This was their first year as an official, supported regional of the Burning Man festival. It took place near Mangakino, Te Ika a Maui. 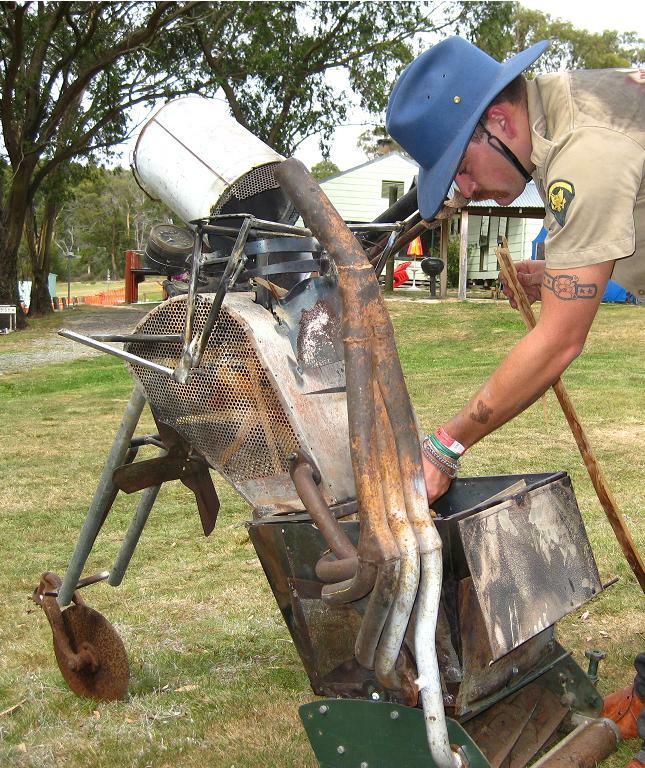 I traveled to New Zealand to work the festival's Ministry of Public Works. The MPW sets up and breaks down the festival, which is a Leave No Trace event. I'm excited to be on the crew so early in an event's life, and plan to return as often as I can. A "yellow bike" program is something that townships do to provide bicycles to their citizens. The bikes are provided by the town and painted a distinctive color. People can use them to get around town and are supposed to leave them on public racks when they are done. If the saturation of bicycles is high enough, theft goes down because the bike has essentially no value. Towns like Austin, Texas that have tried these programs have found a little attrition (usually kids throwing them in the river) but the real challenge is the long-term maintenance of the fleet. At Burning Man 2006 the bicycle crew had managed to paint and assemble about 200 bikes for the citizens of Black Rock City to use. The organization's eventual goal is a saturation of 10 per cent. In theory, you only use a bike far less than ten percent of the day, so that many bikes should be plenty. 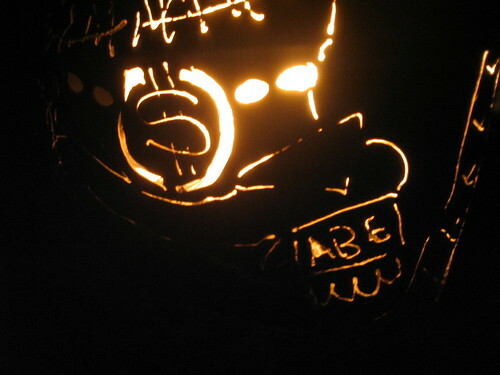 For the 2007 event, an attendee wanted to fund the program so that he himself could take advantage of it. 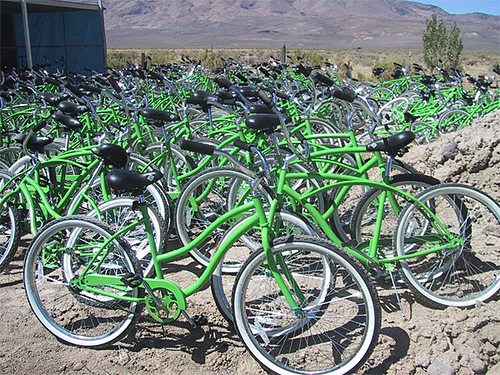 He purchased 1000 Huffy bicycles for the festival, which we painted a distinct green and assembled. 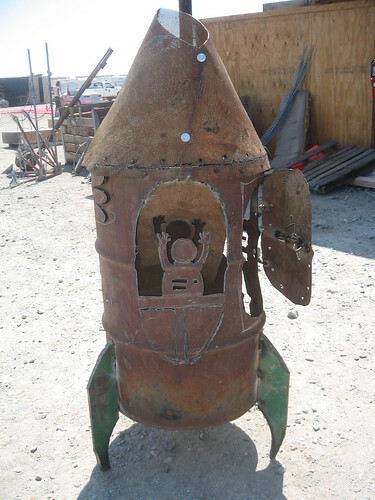 We deployed them on the event grounds and recovered them afterwards. This is a Leave No Trace event, so we also recovered approximately 1500 bicycles that were left on-site. These went again to the Paiute tribe and the Kiwanis of Reno. As our program grows, so has our maintenance requirement. At the 2008 event I will manage a crew for maintaining the existing, assembled fleet. 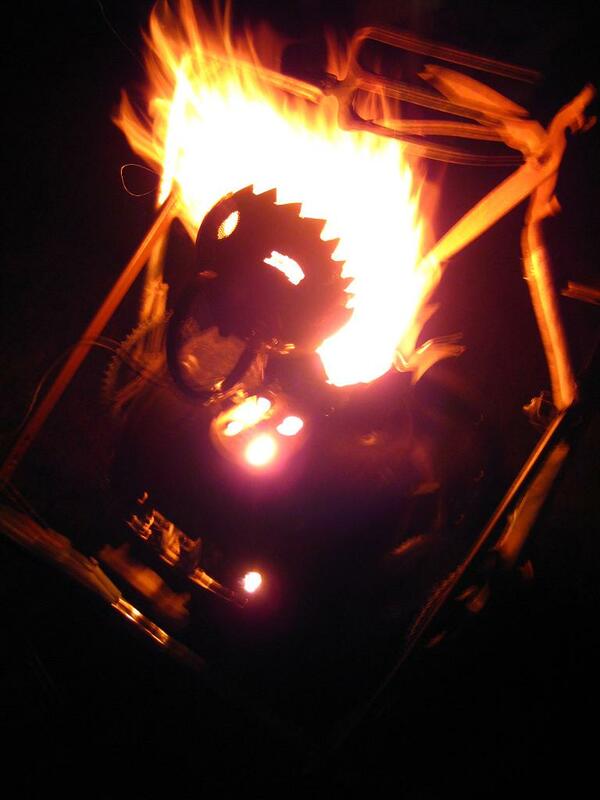 In 2006, the Reno chapter of the Black Label Bike Club was given control of the Burning Man Festival's bicycle management. 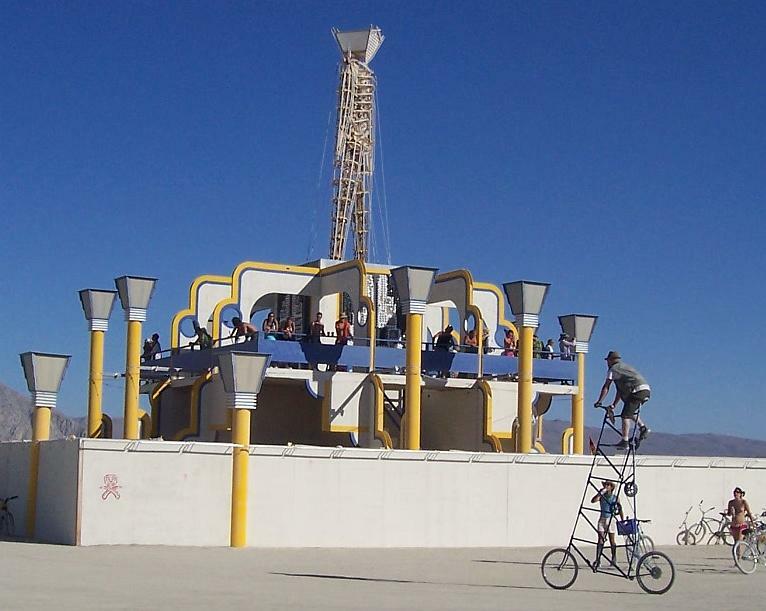 The festival faced a formidable problem: 1500 bicycles left in the desert each year by festival-goers at a no-trace event. The BLBC wanted to use some of them to seed a yellow bike program, but needed someone to deal with the overflow. They knew of my experience shipping bikes to Africa and brought me to the desert. Before the event I worked shade crew, constructing shade for the event infrastructure. Afterwards we distributed the bikes between the local Kiwanis and the Paiute Indian tribe. Thus began my cherished position on the Black Rock City Department of Public Works, where I pick up and distribute bicycles each summer in August and September. Living and working in that harsh environment is the hardest, and most rewarding, thing I've ever done.